Hey Port Dover, we’ve moved! Our new store location is now open at 697 Highway 6 in Port Dover. 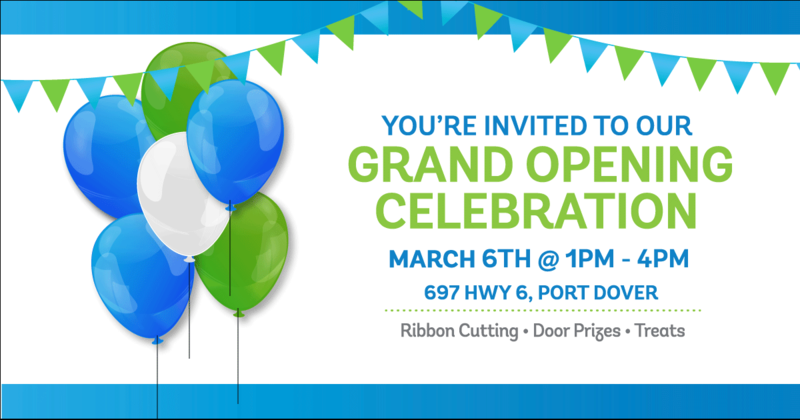 On March 6th, join us for our Grand Opening celebration with refreshments, door prizes, treats and a ribbon cutting ceremony presented by Execulink’s CEO, Ian Stevens and Norfolk County Mayor, Kristal Chopp. Mark your calendars and come find out about the awesome experience you can look forward to with Fibre! *Please note that our office is now open 6 days a week for your convenience! Come visit us, Monday to Wednesday and Friday from 8:30am – 5pm, Thursday from 8:30am – 8pm, and Saturday from 9am – 4pm.